Imaging in the life sciences tends to be characterised by a lack of light. Shine too much light on a cell and it dies, which is why biologists use illumination sparingly. The downside to the super resolution microscopy techniques, which won the Nobel Prize in Chemistry in 2014 and manage to beat the diffraction limit of light by some clever fluorescence imaging methods, is that they rely on quite high laser intensities – not great for live cell imaging. Now, other techniques like light sheet microscopy, also known as selective plane illumination microscope (SPIM), are being developed, which use much lower light intensities and are ideal for live cell imaging, but demand more from the image sensors. At Photonics West, which will take place in San Francisco in February 2016, Dr Ryan McGorty, assistant professor at the University of San Diego, will give a presentation on a SPIM system he and his colleagues developed at the University of California, San Francisco (UCSF) for high content biological imaging. The system McGorty built is designed to take SPIM and make it compatible with high throughput imaging platforms, like 96-well plates or microfluidic devices. In most light sheet microscopes the sample is placed between two objectives, one creating the sheet of excitation light and the other imaging that focal plane. The sample can be viewed from many different angles by rotating it through the light sheet. However, because the sample mounting procedure is so specialised, it’s hard to do high throughput imaging. The technique acquires a stack of images as a 3D data set by moving the sample through the light sheet with a motorised stage. The group is currently working on using adaptive optics to better correct aberrations in the system, in order to work with high numerical aperture objectives and obtain higher resolutions. To capture the stack of images from a light sheet microscope requires a fast and sensitive image sensor. McGorty’s open top SPIM system uses a scientific CMOS (sCMOS) camera. Dr Gerhard Holst, head of research at camera company PCO, commented that super resolution microscopy in general can require frame rates up to 1,000fps, which is achievable at reduced resolution with sCMOS sensors. PCO sells sCMOS cameras to manufacturers of SPIM, structured illumination microscopy (SIM) systems, and super resolution microscopes, including Carl Zeiss for its light sheet microscope and GE for its SPIM systems. Fairchild Imaging, PCO and Andor combined forces to develop a new type of CMOS image sensor providing low readout noise, a sufficiently high frame rate at high resolution, and a high dynamic range. The sensor produced a much higher frame rate compared to cooled CCDs. Life science applications are largely based on the measurement of fluorescence using biomarkers, which – in most cases – doesn’t have high quantum efficiency and therefore requires sensitive cameras. Laser diodes tend to be used as a light source. ‘Being able to get low-cost, relatively high-power light focused onto a small area is very useful, and that’s something lasers excel at above any other lighting technique,’ explained James Saxon, a technical sales engineer at photonics company Laser Components. Laser Components sells laser diodes to customers making bioinstrumentation. ‘High light intensity gives high contrast images. However, too much light could damage the sample,’ noted Saxon. ‘There is normally a trade-off between acquiring the contrast necessary for image analysis while at the same time not damaging the sample.’ High contrast imaging would typically be used for cell counting, for instance. The cameras also have to be stable because, in many cases, when imaging multi-well plates or other high-throughput methods, the scientists want to compare images. ‘It’s an interesting time for using sCMOS for life sciences applications,’ commented Holst. He said that more methods are emerging from companies supplying high-throughput biological imaging. One example is digital pathology using slide scanners to scan multiple biopsy samples. These systems typically use CCD-based colour cameras for colour measurements and sCMOS cameras for fluorescence measurements. The slides are moved automatically and software digitally stitches the images together. ‘We [PCO] enjoy a number of these applications and sell 500 to 800 cameras per year to OEMs making instruments for high throughput imaging in life science,’ Holst said. Fairchild has recently improved the process of making sCMOS wafers and has achieved 10 per cent higher quantum efficiency – the global shutter version now has 70 per cent QE while the rolling shutter sensor has 80 per cent QE. Andor has recently released its Zyla 4.2 Plus camera based on the latest generation sCMOS sensor, offering 82 per cent QE. Hamamatsu also supplies sCMOS cameras. Cellular imaging can be highly specialised. An embryo, for instance, is nearly transparent and its structure is only revealed with sophisticated imaging techniques. ‘To the naked eye, and without the assistance of some fairly advanced imaging techniques, many cells or tissue samples can appear to be invisible,’ commented Martin Price, a director at Munich-based Opto, a company building optomechatronic systems. ‘Add to that the fact that such transparent cells may be suspended in a transparent liquid medium, and in a transparent well plate or petri dish, and you have a real imaging challenge to contend with. Large benchtop microscopes employ classic techniques like fluorescence, polarisation and contrast enhancement to image cells, but often the number of features available on these systems make them complex and expensive, and a challenge to integrate into a machine. ‘To the machine builder, there can be a huge amount of unnecessary cost and complexity attached to integrating a classical microscope, which drove us to develop embedded modules,’ explained Price. 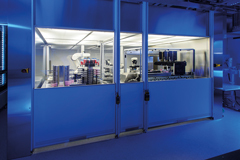 Many of the solutions Opto builds are based on simple modular elements that still offer the techniques found in a full benchtop microscope, but which are condensed down into small, low-cost, easy to integrate modules. 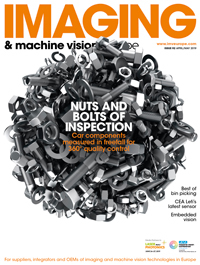 ‘Engineers involved in the design of the latest automated cellular engineering machinery frequently need the raw imaging performance of the best microscopes, but delivered in an ultra small footprint, high performance industrialised module designed exactly to the needs of their machine,’ Price said. The modules that Opto builds differ depending on whether the instrument is a high-end system or an inexpensive handheld device. ‘A low-end handheld device may use lightweight moulded plastic optics; you would be looking to extract the maximum performance out of something that was very inexpensive and mass produced. It may use low-cost CMOS technology, moulded optics, packaged in a small form factor to meet the cost target,’ Price explained. Price commented that Opto’s largest growth area is in developing imaging modules for integration into time lapse cellular imaging machines and other fully automated, and remotely located cellular engineering instruments.